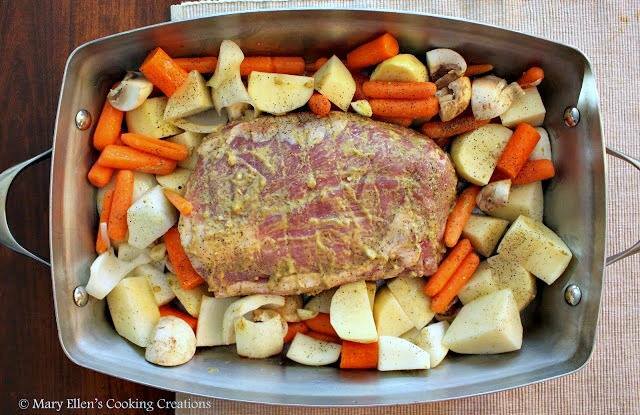 Roasting a large cut of meat with all of the veggies in one pan reminds me of childhood Sunday dinners. Dinners like these are the best - one pan, not much active prep time, and the prep you do have to do is pretty simple. You also get the bonus of the aroma of whatever you are cooking filling your house for a few hours. I picked up a pork loin roast and decided to rub it with one of my favorite flavor combinations - Dijon mustard and garlic. 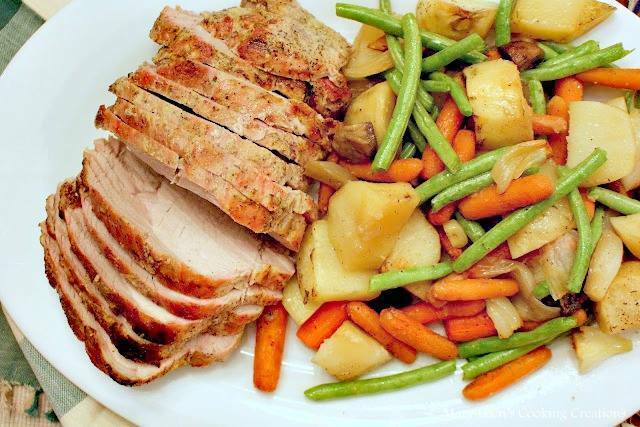 I roasted the pork with onions, carrots, potatoes, garlic, and mushrooms, and near the end of the cooking time I threw in some fresh green beans. I used some chicken broth in the bottom of the pan would use it to baste the pork every 15 minutes or so. The pork stayed so tender and juicy, and the drippings mixed with the broth made a great base for a gravy. Toss all of the chopped veggies with the olive oil, salt and pepper. Pour veggies into the pan surrounding the pork and pour 1/2 c chicken broth into the bottom of the pan. Roast, uncovered, for 1 hour or until the internal temperature reaches 150 degrees. Note: use the juices in the bottom of the pan to baste the roast every 15 minutes. Transfer the roast to a cutting board and let rest for 10 minutes before slicing. Transfer the veggies to a serving platter. 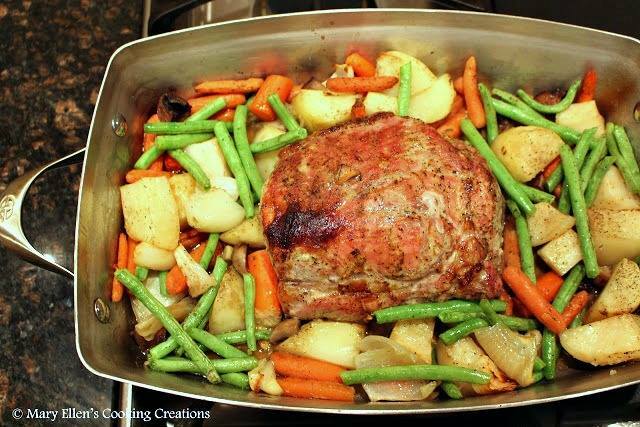 Place the roasting pan over a burner on your stove over medium heat. Whisk together the flour and 1/2 c broth until smooth. Whisk the mixture into the drippings in the pan and continue to whisk, scraping up anything on the bottom of the pan, until the mixture begins to thicken. Let simmer a few minutes before serving over the pork. I love this meal in one! You managed to get all my favorite veggies in there. This would be a perfect Sunday dinner. What brand is your roasting pan? Hi Amy! It is a Calphalon. Perfect rub to bring out the full flavor. Also love one pan for a whole meal. I love using one pan. Easier cleanup and great flavors from everything cooking together! 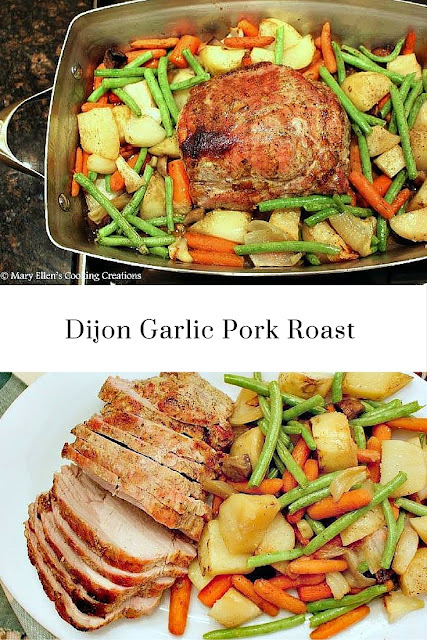 I have been on a dijon kick lately, this sounds so good! We have just been given a lovely roasteing joint and can say hand on heart that I will try this. Thank you! Please report back after you make it! This pork looks delicious! It is on my list of things to make this weekend! Great! Please report back - hope you love it!